I guess I should should come right and and say it: I’m not a phone guy. I’ve has Symbian, Android and now an iPhone 5C (the cheap one, then and now). Further, I seldom use more than 200 minutes a months and way less than a Gigabyte of data. I do, however, use a lot of a battery for GPS (Waze) and Bluetooth for my Fitbit ChargeHR. That said, I’m mostly at work or at home, so there is ample opportunity to charge my phone regardless of how fast I drain it. I suspect this is the case for a lot of people, but then how many times have you heard “I have to go, my battery is about to die.” or “I couldn’t call you, I was on the train and my phone was dead.”. Assuming that these utterances are not a subtle social dodge, I think most folks have experienced this themselves or observed it via friends and family. Still, a dead or close to dying battery was never enough to cause me to act. However, it was top of mind this winter when I was scheduled to go on a road trip across the middle US. I was assuming that charging would not always be available or convenient, so I wanted to make sure we were covered. I’d heard about portable battery chargers of various physical sizes and capacities, most notably by Andy Ihnatko on MacBreak Weekly. This caused me to a brief search on Amazon, where I bought one. It is probably not the model Andy was referring to, but certainly the brand. At $22, I felt is was worth a try. I bought the Anker PowerCore 15600. It’s about the size of a deck and a half of cards and comes with a bag and a charging cable. After the initial charge, I threw it in my bag and didn’t give it much thought. However, after my mid-west trip and another overseas, I am moved to extol the virtues of this charger, and chargers in general, for those on the fence. You can be charging one phone via the car’s power source, and another in your bag with the battery charger. When you arrive at your destination, both phones are fully charged. You can charge your phone bedside overnight without running a cord to the outlet. This means never having to fiddle with the cord at night or in the morning. Outlets are never in convenient places. Use the battery charger and the power is right there. This particular Anker unit is really powerful and long lasting. You can offer power to people in the airport or at a conference without leaving yourself short. In fact, because it has two USB ports, you can charge two devices at once. My MacBook Pro only has one free USB port. 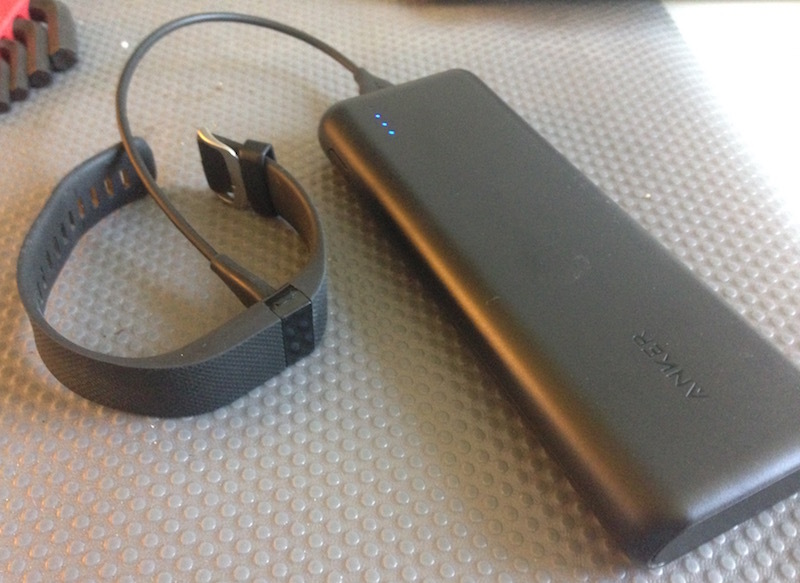 When I’m at my desk, I can sync my iPhone in the port, but recharge my FitBit using the battery. That about covers it. That’s a lot of words about a battery, but maybe you’ll find them useful.